USDJPY is under the influence of BOJ Outlook Report, BOJ Press Conference, Prelim Industrial Production m/m, Monetary Policy Statement, Housing Starts y/y and BOJ Core CPI y/y in Japan and in the US some economic data such as Advance GDP Price Index q/q, Advance GDP q/q and Natural Gas Storage therefore today this chart will be more volatile than before. 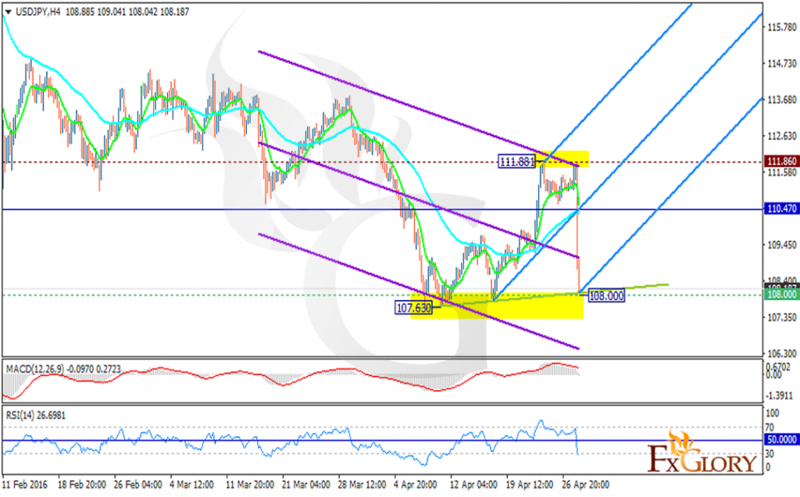 Today USDJPY shocked traders by its sudden fall towards 108.00 but it seems that the recovery from 107.630 is almost completed. The support lies at 108.00 with resistance at 111.86 and the weekly pivot point is located in between at 110.47. The EMA of 10 had a sharp decline as well getting close to the EMA of 50. The MACD indicator is in positive territory showing the price growth but the RSI is below the 50 level suggesting the opposite. There are two scenarios for this pair at this moment, it may continue its downward trend falling down the descendant channel or may climb up the Andrews’ pitchfork. The support level breakthrough may push the price in lower ranges as far as this level is not broken the pair will move in bullish bias. Traders can wait for a better chart setup.